A copper roof is a perfect choice for virtually any home or business in the Towson area, particularly those in historic districts. Copper roofing offers eye-catching beauty and classic charm, along with the rugged durability you would expect from any metal roof. Whether you simply want new flashing or a copper roofing overhang or you want to replace your entire roof with a copper one, Roland Slate Service is the company for you. Our dedication to excellence in the roofing industry has earned us an A+ rating with the Better Business Bureau, along with their prestigious Torch Award, which is given only to companies who show exemplary customer care and integrity. With such a significant investment in your home, you will want to make sure that your new copper roof is fully protected for decades to come. That’s why we offer, not only a manufacturer’s warranty to cover materials, but also a labor warranty that covers all the work that our experienced technicians perform during the installation process. 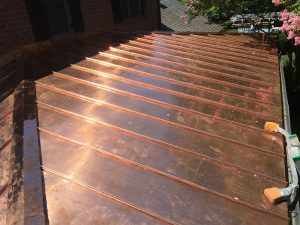 If you would like to learn more about how you can enhance your Towson area home or business with a new copper roof, then contact Roland Slate Service today.